A few weeks ago, Christi and I were texting each other (as we always do!) and she mentioned that she was making blueberry muffins. I just happened to be writing out my grocery list, so of course the craving hit me and I added blueberries to the list. 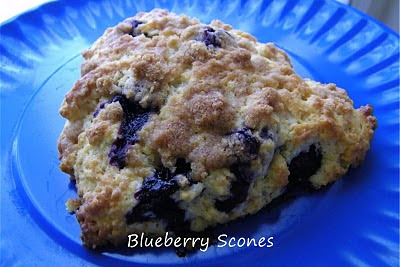 I had actually been wanting to make blueberry scones for a while, I just hadn't gotten to it! I told her that I would probably make scones instead of muffins, and she responded that the muffin recipe turned out very scone-like. Well, now I was intrigued! 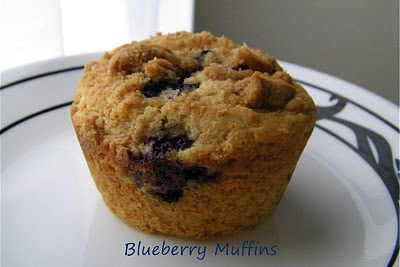 I had a scone recipe that I liked, but I would have to try this muffin recipe too!! I actually got the scones made that day...but to be honest, it was over a week later before I made the muffins! Eh, life happens, right? If you've never made scones before, it's very much like making biscuits. You want to make sure the butter is well chilled, don't overwork the dough, and they are best piping hot right out of the oven!! They really are best when served the day they are made; they're just not the same the next day, in my opinion!! Which was my favorite? I'd have to say the scones. My family seemed to prefer the muffins though. Either way, I don't think you can go wrong!! As a side note, I did go ahead and make the full recipe of the streusel topping for the scones. It makes extra, but it keeps very well in a covered container in the refrigerator for a few weeks. I actually sprinkled some of it on top of the muffins before baking! Preheat oven to 425'F and place rack in the middle of the oven. Line a cookie sheet with parchment paper. To prevent the bottom of the scones from becoming overly browned, you can place the prepared cookie sheet inside another cookie sheet if desired. For the scones, in a large bowl, whisk together the flour, sugar, baking powder and salt. Add the butter and blend into the flour mixture with a pastry blender or two knives. The mixture should resemble coarse crumbs. Gently fold in the blueberries and lemon zest. In a small bowl combine the cream, beaten egg and vanilla. Add this mixture to the flour mixture and stir just until the dough comes together. Do not over mix the dough, or the scones will be tough. Transfer the dough to a lightly floured surface and knead gently four or fives times, then pat the dough into a circle that is 7 inches round and approximately 1-1/2 inches thick. Cut the circle of dough into 8 wedges. Place the scones on the baking sheet. Brush the tops of the scones with a little cream or milk. For the streusel topping, in a small bowl mix together the sugar, flour, cinnamon and butter with a pastry blender or fork until crumbly. Top each scone with a teaspoon or two of the streusel mixture. Cover and refrigerate any leftover streusel mixture. Bake the scones until nicely browned, about 20 minutes, or until a toothpick inserted in the center of a scone comes out clean. Transfer to a wire rack to cool slightly. Makes 8 scones. Heat oven to 400'F. Coat 12 medium muffin cups with cooking spray, or line with paper muffin cups. In a mixing bowl, beat egg; stir in milk and oil until well mixed. Stir in flour, sugar, salt and baking powder and salt just until moistened; batter will be lumpy. Gently fold in blueberries. Fill muffin cups about 3/4 full. Bake until golden brown, about 20 minutes. Remove from pan and let cool. Makes 12 muffins. ok- 1. Your muffins are prettier than mine. I think I over mixed. 3. Everyone in my house loved the muffins. I thought they were ok but wasn't in love with them. What a delicious tale! I love streusel on muffins, so I would love it on scones! When my oven is fixed (or replaced), I'd like to make scones.